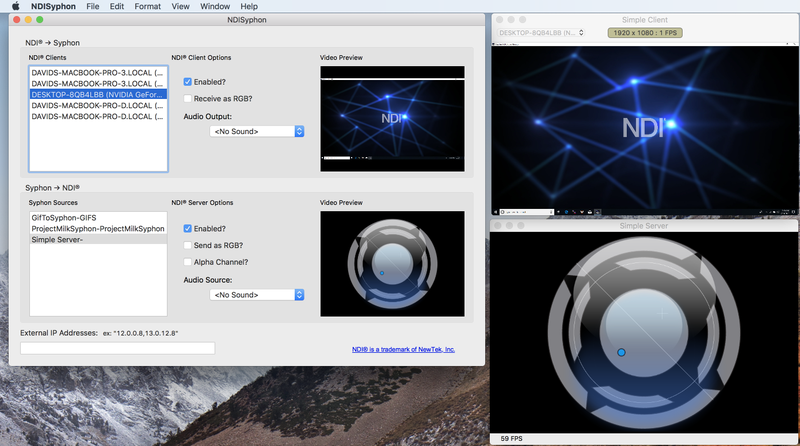 NDISyphon is a simple, free utility that makes it possible for any Syphon enabled software to efficiently send and receive video streams to and from other applications over a network using the NDI® protocol from Newtek. The NDISyphon interface is broken into two main sections: Receiving NDI® inputs (top) and Publishing Syphon streams (bottom). For both receiving and publishing, on the left side of the interface is a list of available sources, NDI® on top and Syphon on the bottom. Selecting an item from this list will display its settings and a preview of its video stream in the panels next to it. Enabled? : Turn the receiving on or off. Receive as RGB? : Uses the higher quality / higher bandwidth RGB stream when available. Audio Output: Set the sound output device to play received audio streams to. Enabled? : Turn publishing for this Syphon feed on or off. Send as RGB? : Send data as a higher quality / higher bandwidth RGB stream. Alpha Channel? : Enable or disable sending the alpha channel with the video stream. Audio Source: Select an optional sound input device to be published along with the video stream. NDISyphon will automatically detect available feeds on your local network and likewise any published Syphon streams will be available to other software on the same network. Using the External IP Addresses field at the bottom of the NDISyphon main interface you can connect with software on other networks. To get the best results with NDI® it is strongly recommended to connect devices over a network using gigabit ethernet or similar high speed connections. NewTek provides a free set of useful NDI Tools applications.